“The changes in membrane conductance of Na+ and K+ that occur during the action potentials are shown by steps 1 through 7 in this Figure. In response to a depolarizing stimulus, some of the voltage-gated Na+ channels open and Na+ enters the cell and the membrane is brought to its threshold potential and the voltage-gated Na+ channels overwhelm the K+ and other channels. The entry of Na+ causes the opening of more voltage-gated Na+ channels and further depolarization, setting up a positive feedback loop. The rapid upstroke in the membrane potential ensues. primarily because the increase in Na+ conductance is short-lived. The Na+ channels rapidly enter a closed state called the inactivated state and remain in this state for a few milliseconds before returning to the resting state, when they again can be activated. In addition, the direction of the electrical gradient for Na+ is reversed during the overshoot because the membrane potential is reversed, and this limits Na+ influx; also the voltage-gated K+ channels open. These factors contribute to repolarization. The opening of voltage-gated K+ channels is slower and more prolonged than the opening of the Na+ channels, and consequently, much of the increase in K+ conductance comes after the increase in Na+ conductance. Thus, voltage-gated K+ channels bring the action potential to an end and cause closure of their gates through a negative feedback process. Relative – after the absolute refractory period till start of after depolarization – a stronger than normal stimulus can cause excitation. Electrogenesis of the action potential. AP leads to reversal of membrane potential so positive charge is on inside and negative charge is on outside, the adjacent normal membrane’s positive charges flow to this ‘current sink’ –> depolarisation of the adjacent membrane–> local response–> when firing level is reached –> propagated response. In myelin covered axons the conduction is sped up because myelin is a non conductor so the next adjacent membrane to be depolarised is at the next node of Ranvier. Current sink at the active node depolarised the node ahead. Nerve fibre types and function. (This table is a source of MCQs). Each muscle fibre = cell= multinucleated surrounded by cell membrane called sarcolemma. II – fast/white/glycolytic, fast myosin isoenzyme ATPase rate and calcium pumping rate. Low oxidative capacity. The Ca2+ binds the troponin C, uncovering the myosin binding site on the actin –> actin and myosin bind, thick and thin filaments move, there is a power stroke. ATP is also used to pump Ca2+ back into the SR to relax the muscle. Muscle fibres branch and interdigitate but each is a complete unit surrounded by cell membrane. The initial rapid depolarization and the overshoot (phase 0) are due to opening of voltage-gated Na+ channels similar to that occurring in nerve and skeletal muscle. The initial rapid repolarization (phase 1) is due to closure of Na+ channels and opening of one type of K+ channel. The subsequent prolonged plateau (phase 2) is due to a slower but prolonged opening of voltage-gated Ca2+ channels. 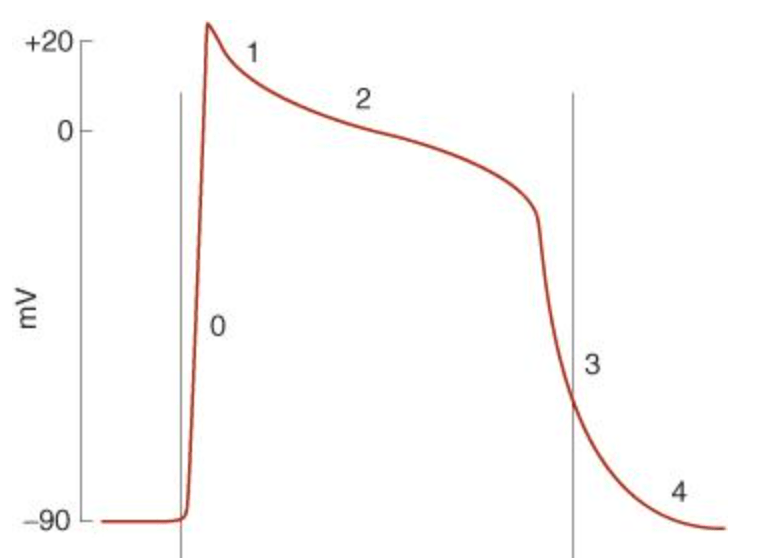 Final repolarization (phase 3) to the resting membrane potential (phase 4) is due to closure of the Ca2+ channels and a slow, delayed increase of K+ efflux through various types of K+ channels. Cardiac myocytes contain at least two types of Ca2+ channels (T- and L-types), but the Ca2+ current is mostly due to opening of the slower L-type Ca2+ channels. Peak of depolarisation K+ starts flowing out causing repolarisation. The K current starts slowing as it becomes hyperpolarised. The funny channel(H channel) which allows Na and K to pass, opens, this starts the prepotential. Ca channel then opens. First is the transient one which completes the prepotential. Next the long Caclium channel opens and results in rapid depolarisation producing the impulse. 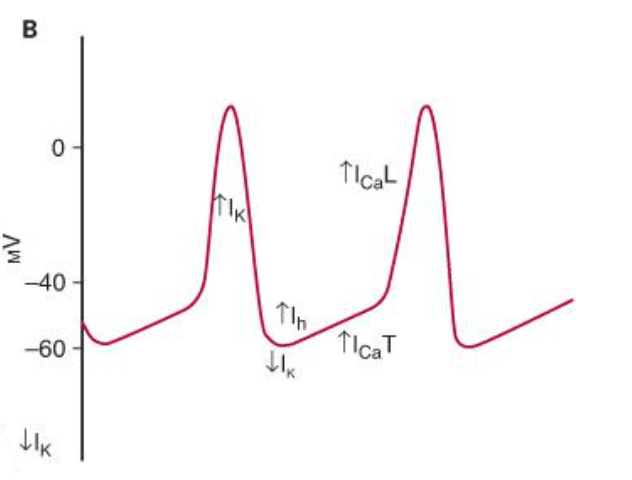 Parasympathetic input vià increased acetylcholine at muscarinic receptors on the pacemaker cells opens K channels and slows opening of Ca channels –> Hyperpolarisation of membrane and decrease slope of the prepotential, decrease firing rate. 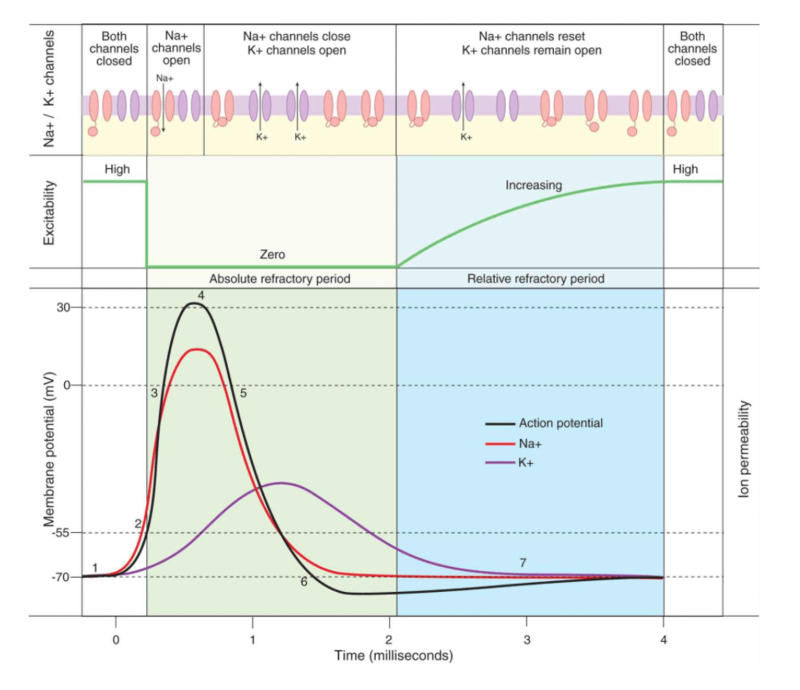 Sympathetic input via increased noradrenaline acting at B receptors(increase cAMP)–> increased opening of funny/H channel and opening of L channel speeds up depolarisation of prepotential so increases firing rate as well as speed up rapidity of depolarisation if the impulse too. High temp can increase HR and drugs like digoxin can decrease HR. Length-tension relationship for cardiac muscle. Continuous irregular contractions independent of nerve supply. Visceral smooth muscle stretch –> depolarises –> contraction independent of any external stimuli. Explain excitation-contraction coupling in skeletal muscle. How is the resting neuronal membrane potential created ? How is the neuronal action potential created ? Explain how a nerve impulse is conducted in a myelinated (or unmyelinated) neuron. Describe the morphology of a cardiac (or skeletal) muscle cell. Explain the significance of the long refractory period of cardiac muscle.